Wow!!! I don’t know about you? but this month raced by, i didn’t even have a chance to post my Thanksgiving recipes before the big day. Having been featured in 805 Living magazine this month, i want to share a delicious “not your typical” stuffed squash dish made with Italian farro, roasted grapes, red onions and scattered with toasted sunflower, sesame and pumpkin seeds and pomegranate arils. Good all winter long using earthy acorn squash, sweet delicata squash, even kabocha squash works well in this dish. Usher in fall with some of the season’s finest fruits and vegetables. Chewy farro—an Italian whole grain—is flavored by grapes that have been slow roasted in a low-temp oven with red onion + rosemary to concentrate their sweetness and release their juices. Arrange the roasted grapes in a single layer in a roasting pan scatter with the red onion slices, red wine vinegar and chopped rosemary and continue roasting for 30 minutes more, until grapes have shriveled to about half their size, and are still juicy. Set aside to cool. Raise oven temp to 400°F. 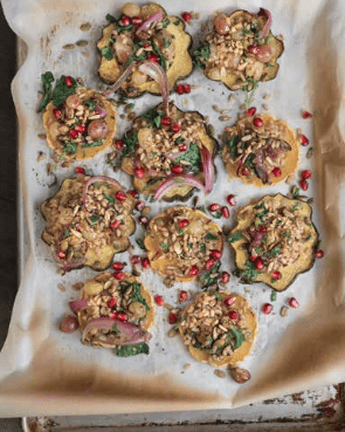 Arrange acorn or delicata squash rings on a parchment paper–lined baking pan that has been lightly oiled. Roast for about 30 minutes, until lightly browned at the edges. These steps can be done earlier in the day. Combine cooked farro in mixing bowl with roasted grapes and onions. Toss gently with mixed baby greens, ½ teaspoon salt and a few grinds of pepper and fill the center of each squash ring with farro mixture and warm in 350°F oven for 15 minutes to heat through. Arrange warm squash on a platter using a flat spatula to carefully lift off of baking sheet. Garnish with seeds, pomegranate and parsley.